Last Date for Submission of Application is on July 14th, 2018..
3.Qualification : (i) BE/B.Tech/ B.Sc (Engineering) in Electronics & Telecom; or Telecom; or Electronics; or any other combination of engineering branches, where Electronics is one of the main branches (e.g., Electronics & Instrumentation). and ii) Having qualified GATE-2018 in EC paper. 4. MEDICAL STANDARDS: Applicant must be physically fit for appointment on the said posts as per A3 medical standards as contained in Indian Railways Medical Manual, Vol.I. Complete details of medical category standards / parameters can be accessed at Indian Railways’ website (www.indianrailways.gov.in > Ministry of Railways > Railway Board > For IR Personnel>Codes & Manuals>Indian Railways Medical Manual Vol. I). These standards shall be relaxable as per disability of the candidates. RailTel’s decision regarding physical fitness of the applicant will be final. 1. Issue of call letters for interview: Interview call letters shall be sent through e-mail only provided by the candidate. Thus e-mail ID should be clearly mentioned in the application form. The candidates are also advised to check RailTel’s website frequently for updates. 2. Candidates currently serving in Govt/Quasi Govt. offices/ Public Sector Undertakings are required to seek prior permission from their employers to apply for the notified vacancy and shall have to submit ‘No Objection Certificate’ from their employer at the time of interview, failing which they shall not been allowed to appear in interview and their candidatures shall be treated as cancelled. 4. The interview call letters issued to the candidates shall be provisional. However, in case any ineligible candidate is issued call letter or even allowed to appear for the interview or finally shortlisted for appointment or allowed to join RailTel, his/her candidature will automatically be treated as cancelled at any stage of this recruitment/ service in RailTel on grounds of his/her ineligibility. Therefore, before submitting the application, the candidate must ensure that he/she fulfills all the eligibility criteria as laid down in this advertisement. His/her candidature will be purely provisional subject to eligibility and other verifications at any stage before or after his/her appointment in RailTel. 5. The decision of the RailTel about the mode of selection, number of posts, eligibility conditions, shortlisting of candidates for interview, empanelment for appointment, medical fitness etc. shall be final and binding. No correspondence will be entertained in this regard. Selection process involves shortlisting on the basis of GATE-2018 score in EC paper followed by interview of the shortlisted candidates. The interview shall be of 100 marks (maximum). The final panel for appointment will be prepared on the basis of performance of candidates in interview. 1. Go to URL (www.railtelindia.com) and click on the link 'Careers'. 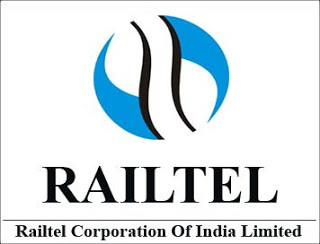 On the 'Careers' page, check the vacancy for “Recruitment as Deputy Manager (Technical) in RailTel Corportion of India Ltd. on regular basis Read the detailed notification and before submission of application form, the applicant should carefully ensure his / her eligibility for the post being applied for. Click on the link 'Click here to apply online for this vacancy'. It will be easy for applicants to complete the application form by keeping the documents like educational details & employment details ready with them before proceeding to fill application form.Complete the pre-registration process by entering details like first name, last name, father's name, DOB, e-mail ID and password. 2. Once the pre-registration is complete, the applicant will receive a mail on email ID mentioned in It will be either in Inbox or in Spam/Junk folder.Check the email ID to get the user name. Once user name is received, click on candidate login page. Enter the user name, password (as mentioned in step 5) and captcha. Main Registration page will open.Vacancy name and details mentioned in step 5 by candidate will be shown. You cannot modify the details mentioned in step 5. So, please enter the details during pre-registration stage carefully. One email ID can be used for one pre-registration only. Enter other details like category, mother's name, address, employment details, qualification details, etc. 3. Based on vacancy, certain information regarding experience criteria is sought in the form of a questionnaire, which is mandatorily required to be filled by the candidate in the form of 'Yes/No' response. Candidate needs to upload the photograph and signature in the appropriate space and format and size mentioned in the application form. Once all the details are entered, candidate can either proceed to 'Edit Application' to modify the details entered in main registration page or click on 'Submit' option to proceed to make fee payment. 4. After clicking on submit button, candidate can review the details entered by him/her. This page will give details of the payment to be made by the candidate. Click on 'Make Payment' Button. Payment gateway will open. Candidate needs to enter the details as asked for in payment gateway and make payment accordingly. Candidate will receive payment confirmation mail on email ID mentioned in payment gateway page.Once the payment is received by gateway, candidate can take a print out of the application. The link for on-line registration/application (including fee payment will be disabled after 14.07.2018 (1200 hrs. ).